I am a bit of a storage person. And I like to know what's on my device... sometimes knowing you're low on space but not knowing what causes it can be a real stress. You may go into your Apps settings and delete data or uninstall apps that you might think are gobbling up your space. Which is all well and good, but sometimes you may be going after the wrong target. Enter DataSize Explorer. 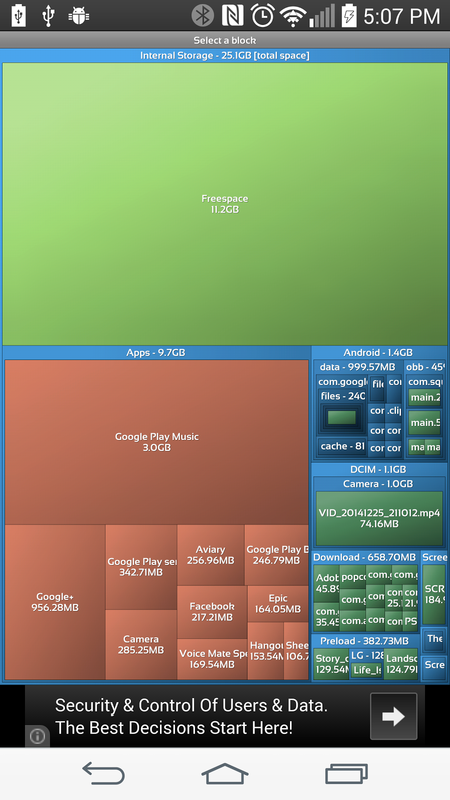 This free app scans your phone's storage and displays the files it has on there visually. The bigger the block, the more a certain area is taking up of your phone. They've recently updated it so that when you long press on a specific block you can view properties, or open the file or even just delete it if you like. VERY HANDY. You have the option of being able to see, or not see, your free space as a comparator. My son's phone had tons of games and whatnot on it and he was constantly getting the low space warning, so he'd just delete an app. But as it turns out, some Minecraft skin app he had was downloading skins and putting them in a separate folder. Even after he uninstalled it, it still left hundreds of megabytes just sitting there, never being used. Without having to go into a separate file explorer and check each and every one of the folders this very quickly gave us a graphical guide to which were the storage hogs, letting us take appropriate action.